Changeable. That's the word to describe our weekend weather. Friday was unsettled, then warmed up and the sun shone. We had guests for dinner and began out on the deck, enjoying the summer evening. We finished the last bites of the main course in between raindrops and moved the gathering indoors for dessert. We had ringside seats to a spectacular and unusual lightning display. Sunday: Grey clouds. Mist hung over the city. We went downtown and took in a little of the Mexican fiesta in Centennial Square, admiring the grace and enthusiasm of the dancers who didn't let a little fine rain stop them. Then to the Royal B. C. Museum to take in a couple of special exhibits. One on dinosaurs, the other on Cecil Beaton's photographs of Queen Elizabeth II. The dinosaurs didn't hold my interest, so Tim and I went our separate ways, and I enjoyed the photographic exhibition on my own. What struck me is the immense effort that went into these portraits - lighting props, elaborately painted backdrops, ladders, assistants - to make them into the works of art we enjoy. We met up to tour the First Nations exhibit where I learn something new every time I visit, and concluded with hot chocolate in the cafe. It was that kind of day. I hope you've had a good weekend, as I have, regardless of the weather. Joining Mary of the Little Red House for another Mosaic Monday. It's hard to believe it's July, isn't it? We had very hard rain in the morning, and mist the rest of the day. I must get myself down to see the exhibit of photographs soon. We have had most clear days and just recently some rain. Sounds like you had a busy weekend. Lovely post and photos. Thanks for sharing. Great black and white mosaic! Your photos are wonderful....they look black and white with just a touch of red! What a great mosaic they make! Enjoy your week! Hope you see the sun soon! We had a little shower here this afternoon and it cooled things off some! I would have loved to see the photos of Queen Elizabeth. My weekend weather just the same, but I am so happy to see rain. The garden was suffering from lack of moisture. Enjoy your week. Our weather has been unsettled too.. Seems to be a " pattern." enjoyed the museum mosaic! Oh I'd have loved to see the photos. I think Queen Elizabeth has always been a very attractive person. The photos of her mother as a child are beyond beautiful. Wonderful shots of museum. very nicely arranged. You just reminded me to check if any museums near me will be hosting the Cecil Beaton exhibit. Sigh. Lovely. OMG - we LOVE that museum and have always told people who will visit Victoria to make an effort to go there! We always stop by and have never been disappointed - saw the Titanic Exhibit last time when we had our granddaughter with us - that was exciting. You mention the First Nations exhibit - I recall it being excellent in every way. We love the history of a place and always try to make it to at least one museum wherever we go - your Royal B.C. remains at the top of our list! As for Cecil Beaton's photos of the Royal Family, they have always being astounding and I would love to see this exhibition. Must check to see if by chance it's going to come anywhere close by here - if so I'll try to go. 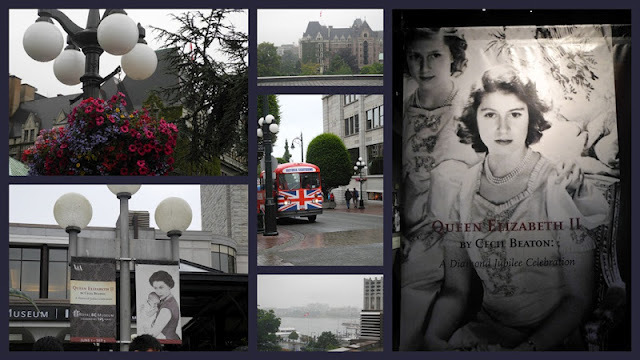 Just seeing The Empress tucked up in the corner of your great collage makes me want to be back in beautiful Victoria again! Well perhaps I won't be as lucky as you dear - just checked the exhibition schedule and it looks like just Australia and Canada are the only lucky countries getting to view it after the V&A in London. OZ was prior to Victoria and then it goes to Toronto in Sept. I was surprised to wake up to grey skies and drizzle yesterday. We had outdoor pans for the day...which quickly became indoor plans. I'm sure the rain was just what ou crops needed though! I always enjoy visiting the Royal Museum...and took in the Titanic Exhibition when it was there. I would find the Royal Family Photo display most interesting...but am not sure I'll make it there in the next six weeks! She is a lovely queen still, and so beautiful when she was young! If I'd been there with you I would have headed for the photo exhibit. The museum is an amazing place to explore. I like the black and white look to your collage. Ohhhh... what a lovely exhibit...... She's still beautiful! And I marvel that she seems able to wear any colour and look positively radiant! I thank God for her example. The Queen Elizabeth portraits looked like a wonderful exhibit Your photos look very atmospheric. So much of the US is having severe drought now and would welcome some of that cool rain!